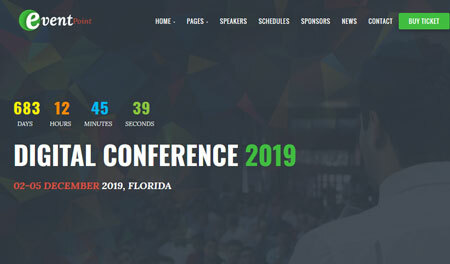 Grand Conference: comes with demos, so you can start putting your site together fast. It has over 30+ pages for your events. You get to display conference sessions by day, schedule, location info, and more. The theme is WooCommerce friendly. 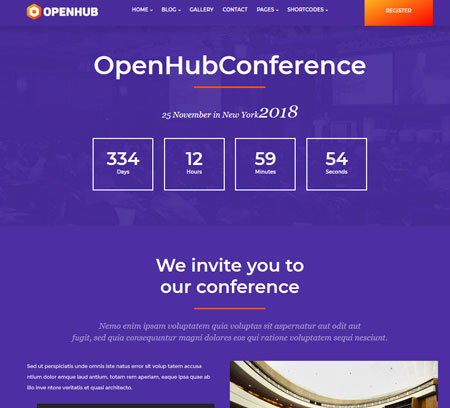 OpenHub: a clean theme for events and conferences. It has one-page functionality. With the Redux theme options panel, you can customize your site fast. The theme comes with Visual Composer, Slider Revolution, and Video & Background Parallax. 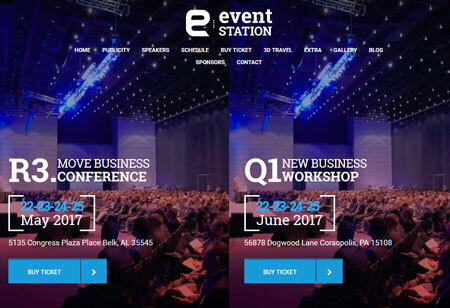 Event Station: another WooCommerce theme for conference sites and events. 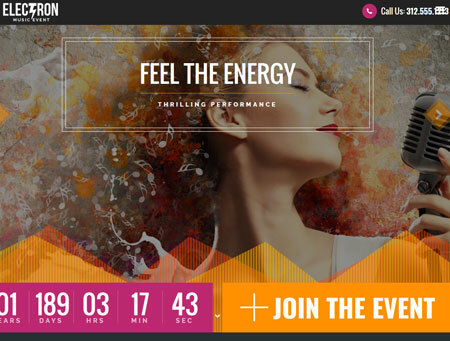 It has speaker & schedule management, 3D tour functionality, and responsive design. Can handle unlimited events. Meetup: can be adapted to any event. 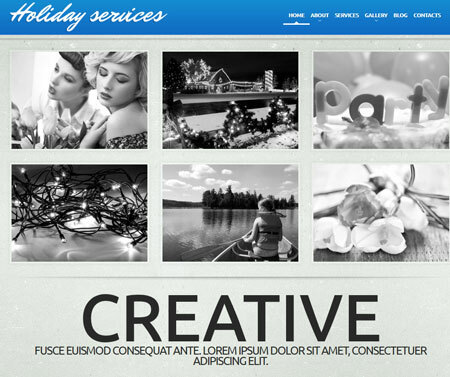 It has a slider and video header, responsive design, VC page builder, and WooCommerce support. It also works with Tickera. You get 8 demo homepages to get started faster. 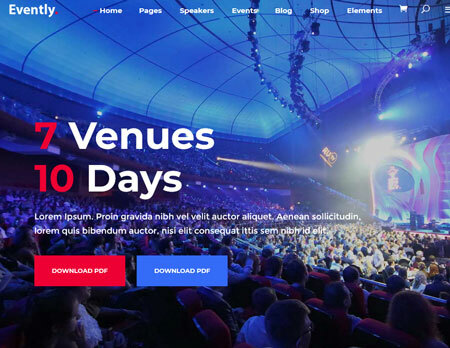 Eventum: has 7 homepage variations you can use to promote your events. It is responsive and ready for mobile devices. 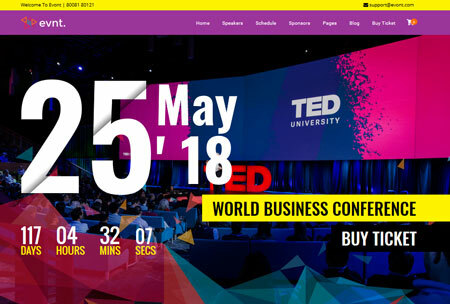 It comes with an event countdown timer, unlimited color schemes, speaker list, and WooCommerce support. 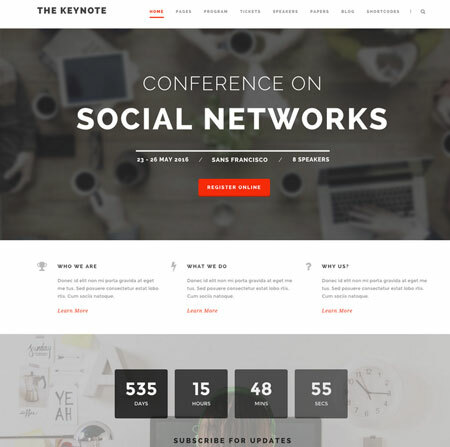 Evently: this conference theme has 9 homepage templates for a variety of events. It comes bundled with Timetable Responsive. It is responsive and ready for Retina displays. A bunch of custom shortcodes are also included. This theme is WooCommerce compatible. 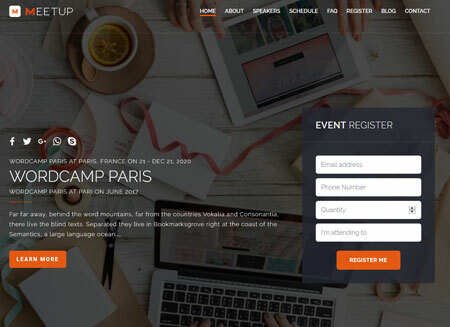 Evnt: this event theme comes with 10 time schedules, 4 speaker lists, multiple price tables, and Visual Composer support. You also get 6 widget areas. You can add as many locations you want to its map. 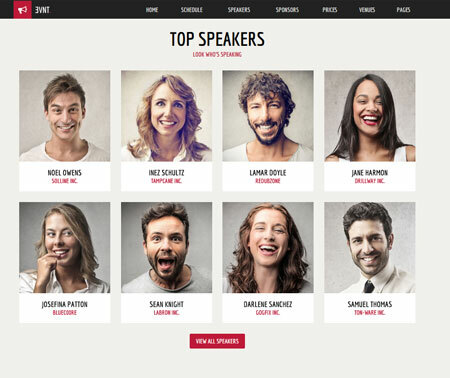 Evont: this commercial conference template comes with easy speaker, schedule, and sponsor management. It is responsive and ready for WPBakery page builder. Supports RTL languages. Entertainment.Event Planner: a responsive theme with over 80 shortcodes, web fonts, and custom page templates. It is coded in HTML5 and CSS3. Event Point: a gorgeous theme for meetup events. It comes bundled with Slider Revolution and WPBakery. You get speaker, schedule, and sponsor management features. Lets you maintain a sideblog too. 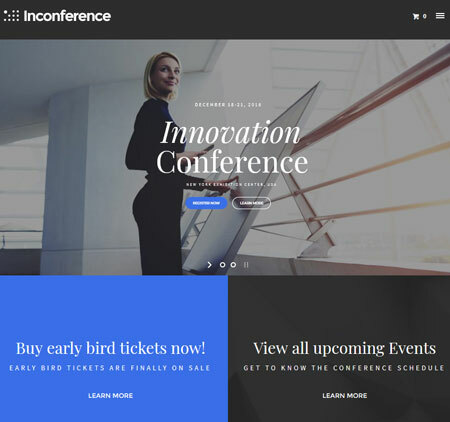 In Conference: a theme for technology conferences, product release events, and other corporate meetups. You will be able to display event info with a simple shortcode. The theme has shop functionality and a drag & drop page editor. im Event: available in dark and light versions. It comes with plenty of colors for you to experiment with. 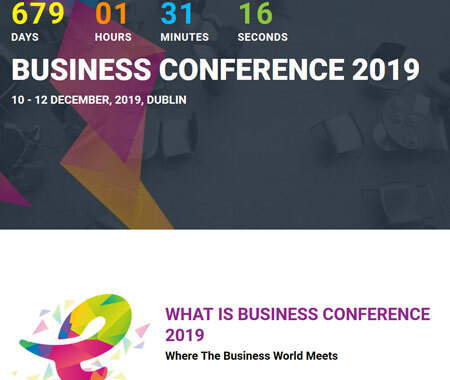 im Event is WooCommerce enabled and supports pay via EventBrite. It supports RTL languages. 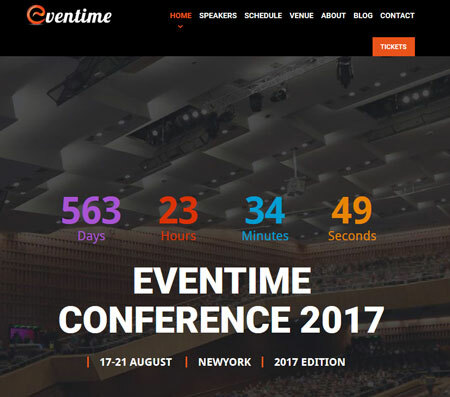 Eventime: an event theme with various header, schedule, speaker, and countdown styles. It works with WooCommerce. It is powered by the Redux framework. This theme is based on Bootstrap 3. The Keynote: made for meetings, exhibitions, and everything in between. Lets you sell tickets via PayPal. The theme has a mega menu system, boxed/full width layouts, Font Awesome integration, and multiple blog & portfolio styles. Electron: useful for concerts, musical events, and other special occasions. It has a drag & drop page builder and integrates with Tickera and Eventbrite. 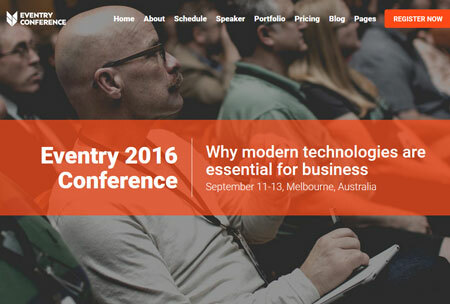 Eventry: a landing page theme for events. It has 4 homepage styles and 10 color schemes. You get an event counter widget and responsive event schedule. 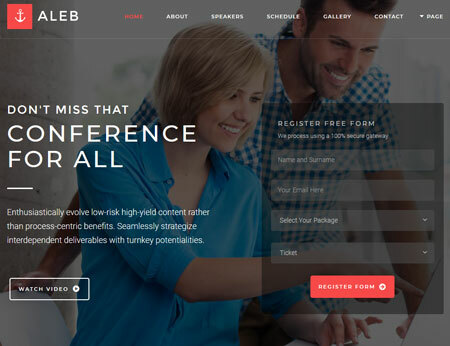 Aleb: another one-page theme for your events. Lets your visitors register via PayPal. Supports Eventbrite too. The theme comes with Visual Composer and Cube Portfolio bundled. 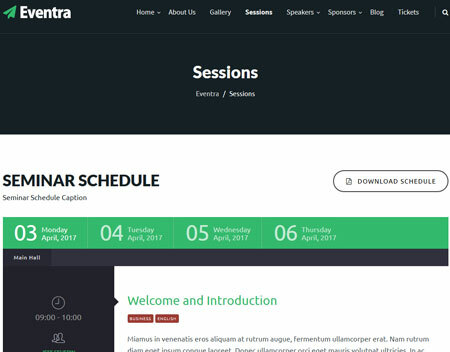 Eventra: a WP theme for seminars and conferences. It has 5 header styles, unlimited sidebars, Google fonts, and a bunch of useful shortcodes. Comes with Business Hours Pro plugin. 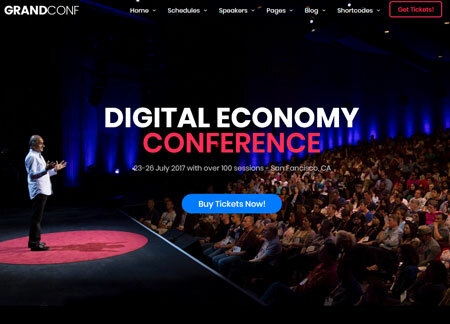 Have you found more attractive conference themes? Please share them here.